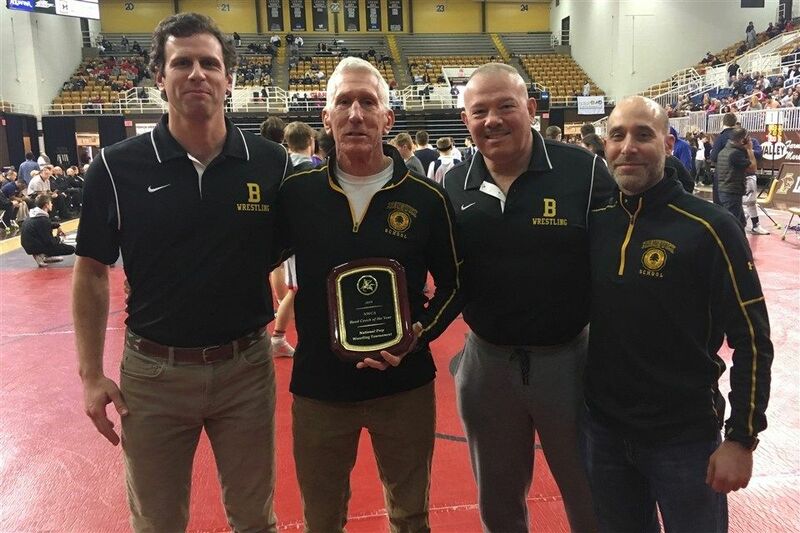 As a team, the five-member Brunswick contingent collected 37 team points, good for 21st place out of 122 teams at the 84th meeting of the top prep school wrestlers from across the country. Ostrye was recognized as the National Head Coach of the Year in front of the Stabler Arena crowd prior to the start of the championship round. A week earlier, Ostrye was tabbed by the NEPSAC coaches as the Coach of the Year. This year the Bruins posted an 18-1 record, won both the FAA and WNEISWA tournaments, and finished fifth at the NEPSAC tournament. This year, Perry, the eighth-seed at 126, won his opening two matches, but fell to the top-seed in the quarterfinals. Perry battled through the consolation round, knocking off the sixth-seed and fifth-seed before a setback against the 10th-seeded grappler in the consolation semifinals. In the battle for fifth place, Perry picked up a 4-2 win over the fourth-seeded wrestler. Over seven matches, Perry faced six ranked wrestlers and went 5-2 overall. Errico is now the seventh All-American for the Bruins and the second one in his family to earn the award while at Brunswick. Brother Jon Errico ’16 was a two-time All-American for the Bruins. Following an opening round bye, Errico, holding a 44-0 mark as the seventh-seed at 138, topped the 10th seed, but dropped a 10-7 decision to the second-seeded wrestler in the quarterfinals. Errico followed a similar path as Perry in the consolation round, knocking off two ranked wrestlers before a setback. Errico topped the 12th seed and the eighth-seeded opponents, while the fourth-seeded wrestler bested Errico in the consolation finals. Errico picked up a 6-5 win over the fifth seed to earn a fifth-place finish. Against six ranked opponents, Errico posted a 4-2 mark. Saunders, ranked fifth at 195 pounds, won his opening match, dropped the quarterfinal bout, and picked up a pair of wins in the consolation round. For the second-straight year, Saunders reached the Round of 12, also known as "the blood round," falling one win short of a top-eight finish and All-American status. In his final match, Saunders lost to the seventh seed, 3-1. For the tournament, Saunders held a 3-2 mark.